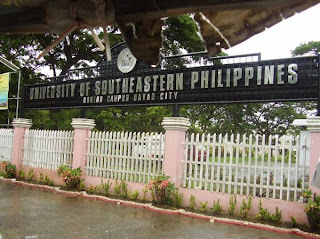 University of Southeastern Philippines is near to my heart because I finished my high school in this university. I miss the high school fun and friends. I also started my master's degree last 2006 and I am hoping to get a scholarship to minimize the expenses. I miss my school and I am contemplating if I will go back to school next year. I love my school because I can experience the university feel. Cool air, wide area to roam around, and big oval to hang out. 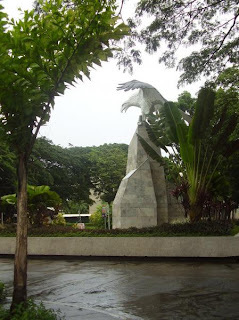 This is the very famous "eagle" of USEP. Any Usepian you know will surely agree that this is the most famous meeting place, tambayan of Laboratory School students (when the classrooms are flooded...hehehe) and the symbol of the school. I can still remember when the Laboratory School classrooms are flooded, we hang out in this place. You can easily tell from the gate that there is no class. I love rainy days during my 1st and 2nd year in high school but I began to hate it when I entered my 3rd year. On my third year, I joined PMT (Preparatory Military Training) and we always clean the flooded room together with the Boy and Girl Scout members. I know it's dirty but it's fun.hehehe. 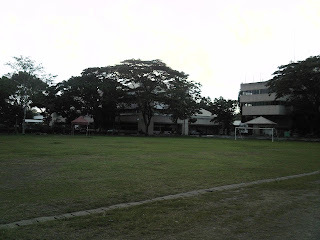 I finished more than 10 rounds of jogging here in the oval during my high school days. hehehe. I love to people watch and just hang out in this place. I also made different military crawls here. The School of Governance and Management is near the oval and I have to walk this open area on a hot Saturday afternoon to attend my masteral classes.huhuhu. I really love my school and I wish we can have an alumni homecoming and share stories again just like before.